Currently the “it” destination to visit in South East Asia has definitely gotta be Myanmar, formerly known as Burma. One of the reason why Myanmar is on the “MUST VISIT LIST” is because the country has finally opened her arms to foreigners. Like others, I was excited to make my first trip ever to Myanmar. In order to visit Myanmar, you have to obtain a travel visa which is applicable to all nationalities. I applied my visa in Bangkok after checking out an English based Myanmar Forum. Found a very detailed posting on how to obtain the visa from the Myanmar Embassy. I did quite a bit of research on Myanmar, especially the street food scene. I want to get myself familiarize with the food and it has always been my goal to find out the national dish of the country that I will visit. From what I gather, “Mohinga” can be considered as one of the national dishes. My flight from Bangkok was at 7.15am and will arrive at Yangon airport at 8.00am local time. Yangon is 30 minutes behind Bangkok time. From the airport to my hotel, the ride was around 45 minutes. I still get very excited about visiting a country for the very first time even though I considered myself a seasoned traveler. The taxi ride to my hotel, which is Eastern Hotel cost me $7. When I reached my hotel, I was greeted by the friendly staff and offered a welcome drink as well. I was informed that after 45 minutes I will be able to check in. I then asked the hotel staff if there’s any roadside stall selling Mohinga nearby. She smiled as she told me there’s a famous restaurant named Lucky Seven who sells good local dishes. I would like to believe she smiled because she is happy to see a first time visitor to her country eager to taste her national dish but in reality, most probably she smiled because, “Oh – Another first time visitor to my country checked online information about the food of Myanmar and trying to impress the locals with his limited knowledge“. Finding the restaurant was not hard at all and the restaurant was packed with customers, mostly locals – a very good sign! I found a table and was given an English menu and just pointed at the picture of Mohinga. The waiter then showed me a list of side orders, which consisted around 6 different choices but he made a “peace” sign with his hand which I took it as – “you are only allowed to choose 2 out of the 6 side dishes”. I chose the fried shallots and a hard boiled egg. My order came within 10 minutes and I wasted no time in tasting Mohinga for the very first time. It didn’t taste as I would have imagined but that is because I have the habit of associating the taste of the food based on how it looks like. It looked kinda like a version of a Malay noodle dish that is call Mee Rebus and I was expecting it to taste like that. So, I continued to eat slowly and let my tongue get familiarize with the taste of Mohinga. My final verdict? I didn’t get the “SPICEGASM” feeling that I was expecting but I think Mohinga sure can grow on you after sometime. 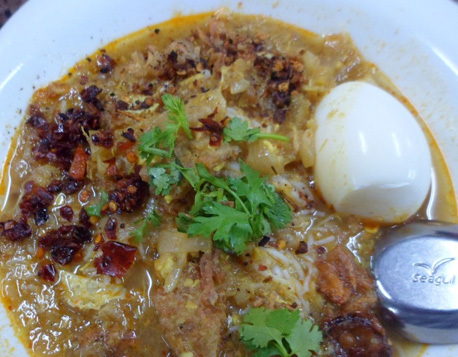 I wasn’t disappointed at all and would definitely try more Mohinga during my stay here in Yangon. I remembered seeing about Anthony Bourdain visiting Myanmar in some sites while I was doing my researched about Myanmar but didn’t clicked on the video link to see the full content. I am curious now to know what was his reaction when he first tasted the Mohinga. Even though I always believe that I know Asian food better than him but I just can’t help to feel “good” if a celebrity chef shared my same sentiments, even though most of the time he is obliged to give good reviews.